I think my pain threshold is generally quite high. I have given birth to three children, had nine tattoos and regularly have my eyebrows waxed. I had heard that epilating was really painful, but how bad could it really be? 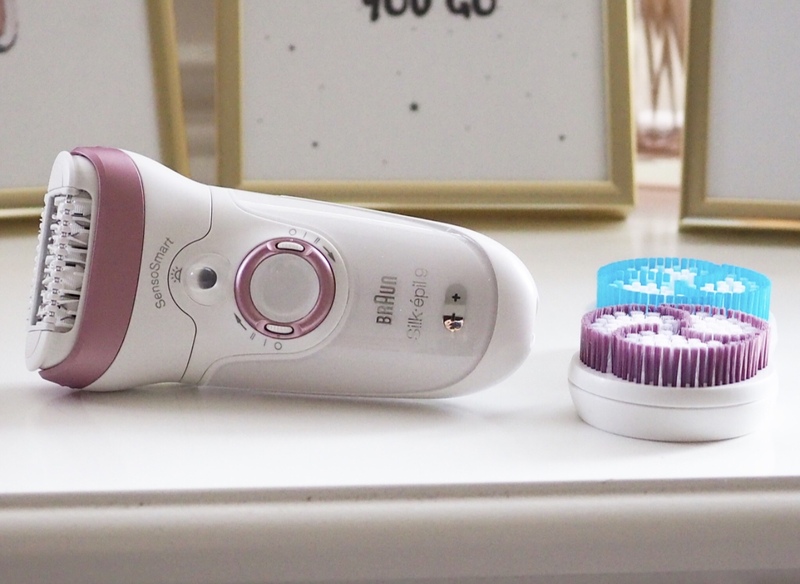 Recently I was sent the Silk-epil 9 SensoSmart epilator from Braun and I decided to put it to the test and find out the answer to the question how painful is an epilator? My mum has used an epilator before and advised me to have some ice to hand to numb the area first. I decided to try it without this to begin with and set to work charging the epilator. It requires just two hours to charge, which meant that before long I was able to start using it. The epilator offers 4 in 1 epilation, exfoliation and skin care with exfoliation brushes and massage pads allowing a complete beauty regime in the comfort of your own home. The epilator can be used either dry or wet, meaning you can take it with you into the shower if you want to which is brilliant. Although the epilator is designed to withstand water, try not to submerge it into the bath as this can damage it. I decided it was best to start with my legs, as a larger surface area might make the pain a little less intense, and opted to use the epilator before having a shower. The epilator has different speed settings, allowing you to find the right one for you. I went for the slowest speed to start with and got to work. I did find it quite uncomfortable to begin with, but totally bearable and you get used to the sensation with prolonged use (the epilator is designed to be used daily if you wanted to but results can last a week or more). The SensoSmart technology prevents you from pushing down too hard onto your skin, whilst the pivoting head makes it easy to manoeuvre around curves on your body such as around your knees. When it came to removing hair from my bikini line, I was a little concerned it might be more painful but it was actually not too bad and I was able to get a really precise finish using the bikini trimmer attachment. The epilator comes with an instruction booklet, which advises you to use the epilator in the evening in case of any redness. There was a little redness afterwards, but this settled down after a couple of hours. I was really impressed – my skin felt silky smooth and looked fantastic. Plus it took less time than going for a wax and the results seem to be longer lasting, meaning less time getting ready for those Christmas parties – result! I would recommend the Braun Silk-epil 9 SensoSmart epilator if you are looking at giving epilating a go. It is priced at £129.99 on Amazon currently and comes with the skin care brushes as well as the epilator and attachments for both bikini line and face, making it great value for money. I would say it takes a bit of getting used to, and probably isn’t for everyone as with all methods of hair removal. So, did I find the answer to the question how painful is an epilator? Everybody will have a different pain threshold but for me, it was definitely not as bad as I had heard. I would agree with my mum and have some ice to hand if you are worried, not only is it good for numbing the skin prior to using the epilator but it is also brilliant for soothing skin afterwards too. I was sent the Braun epilator for the purpose of review, however all words and images are my own.